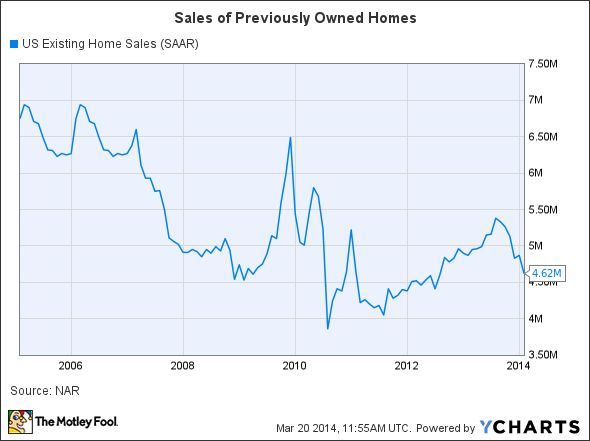 Why Lennar and Burlington Stores stocks are on the move today. Investors can expect a lower start to the stock market today: The Dow Jones Industrial Average (DJINDICES:^DJI) has lost a moderate 33 points in pre-market trading. Global indexes fell overnight in the wake of yesterday's policy announcement from the Federal Reserve that hinted at a quicker rise in long-term interest rates than many had assumed. Markets in Europe and Asia all fell by more than 1% overnight. Next up on today's economic calendar is a fresh reading on the U.S. housing market from the National Association of Realtors. The pace of sales of previously owned homes is expected to come in at 4.6 million units in February, about even with January's result. February's housing numbers were likely held down by severe winter weather in many parts of the country. Look for that housing report to be released at 10 a.m. EDT. Meanwhile, news is breaking this morning on several stocks that could see heavy trading in today's session, including Lennar (NYSE:LEN) and Burlington Stores (NYSE:BURL). Lennar this morning announced surprisingly strong quarterly earnings results. The homebuilder's revenue spiked higher by 38% to $1.43 billion as it delivered 13% more houses than in the year-ago period. Wall Street had expected sales to come in at $1.28 billion. Lennar's earnings were well ahead of estimates at $0.35 per diluted share thanks to a 3 percentage-point improvement in gross margin. CEO Stuart Miller said in a press release that the industry is still "in the early stages of recovery," and that rising home prices last quarter could bode well for the upcoming spring selling season. Lennar's stock was up 2.1% in pre-market trading. Off-price clothing retailer Burlington Stores today booked earnings results for its fiscal fourth quarter. As expected, sales ticked higher by 1% to $1.3 billion. Still, Burlington was able to book a pace of growth in same-store sales that most retailers would dream of: comps rose by 4% for the holiday quarter. Profitability also expanded slightly as overall earnings were $1.07 a share. Burlington's outlook for the next year calls for sales to grow by about 6% while earnings spike higher by roughly 35%. The stock was up 5% in pre-market trading.